Drumlanrig, Scotland was once the location of a Roman fort, now situated within the grounds of a grand manor house, Drumlanrig Castle. 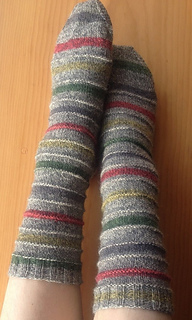 These socks are designed to play nicely with self-striping yarn, and they knit up surprisingly fast. It is also nicely suited for the discerning male sock recipient, or those who appreciate a more minimalist design. 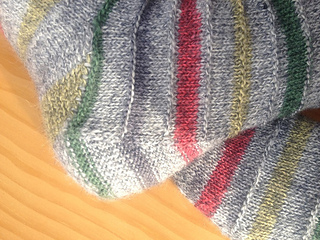 This pattern is great for TV knitting! 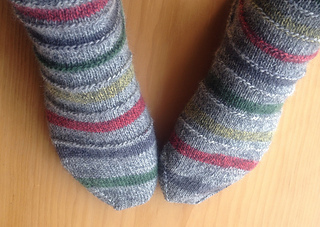 About sizing: the stitch counts for the three available sizes are 60, 68, 76 sts. The smallest size fits a 7.5-8-inch diameter foot nicely. Drumlanrig was featured on Time Team in season 12, episode 4: Fighting on the Frontier.